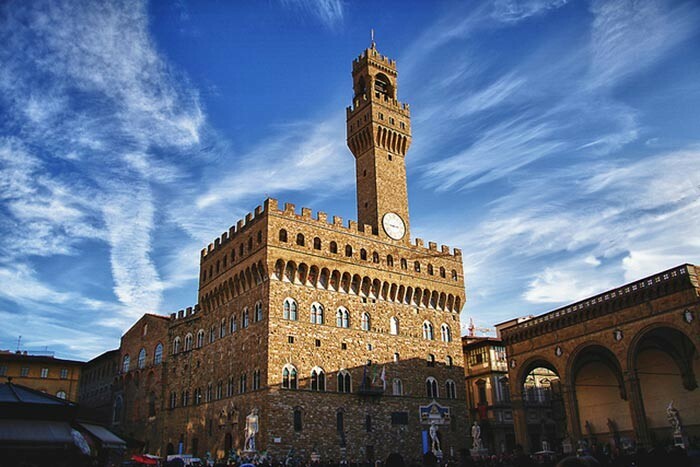 Palazzo Vecchio dates back to the 14th century and is now the city hall of Florence. Palazzo Vecchio dates back to the 14th century and is now the city hall of Florence.The building was finished when a bell was finally placed in the bell tower. The bell was used to announce either danger or town meetings. The gothic style building has remained intact since its initial construction. The outside of the building is simple but elegant except for a section right above the entrance. This section with its marble frieze was added in 1528. There is an engraving which states “Rex Regum et Dominus Dominantium” which means Christ was the only ruler. The engraving is surrounded by a gilded statue of a lion on each side. 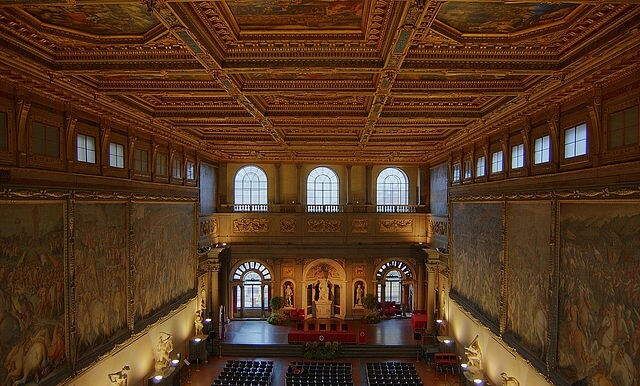 The most exciting room is the Salone dei Cinquecento, (the Hall of the Five Hundred). Michelangelo and Da Vinci were originally asked to decorate the room but Giorgio Vasari was later commissioned by Cosimo I from 1563 to 1565. The walls show scenes of Cosimo I’s victories over Siena and Pisa. The murals are truly a work of art.